TCI Sailing Association is a boon to the sailing community. The Turks & Caicos Islands are surrounded by some of the world’s most beautiful seas, and sailing is a superb way to enjoy them. There’s something magical about harnessing the wind’s invisible power to fill a sail and propel a graceful boat through the water. Sailors have long been drawn to the Islands to practice their art, and sailboats played an important role in the country’s heritage. 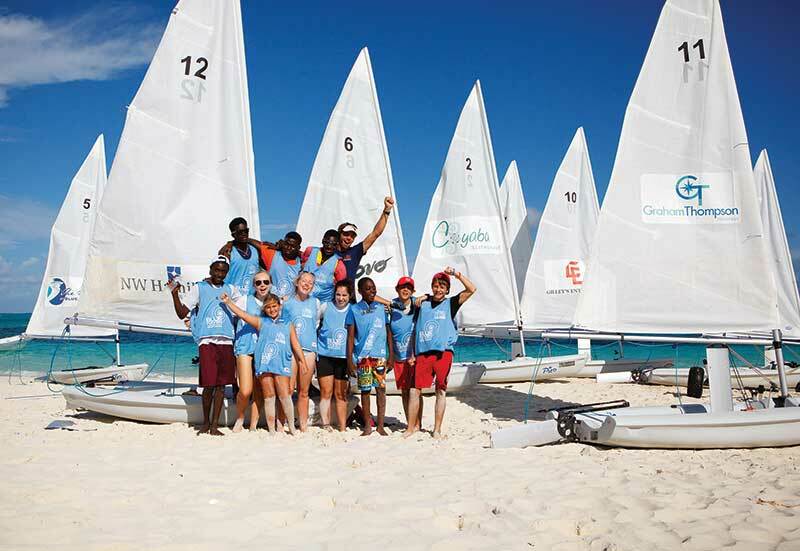 The Turks & Caicos Islands Sailing Association fosters the resident sailing community through lessons, races, and regattas. It is a well-organized and joyful group, who seeks to spread the love of their sport across the TCI. The now-legendary Fool’s Regatta was first held on April 1, 1990 in Sapodilla Bay. Each year, it grew in popularity with sailors and beachside well-wishers, eventually moving to Grace Bay and adding many new events. Its early participants formed the backbone of the Provo Sailing Club in 1998. The organization’s original intent was to hold informal races among sailing enthusiasts in Providenciales. The club has since expanded to teach hundreds of new sailors and host internationally recognized regattas. 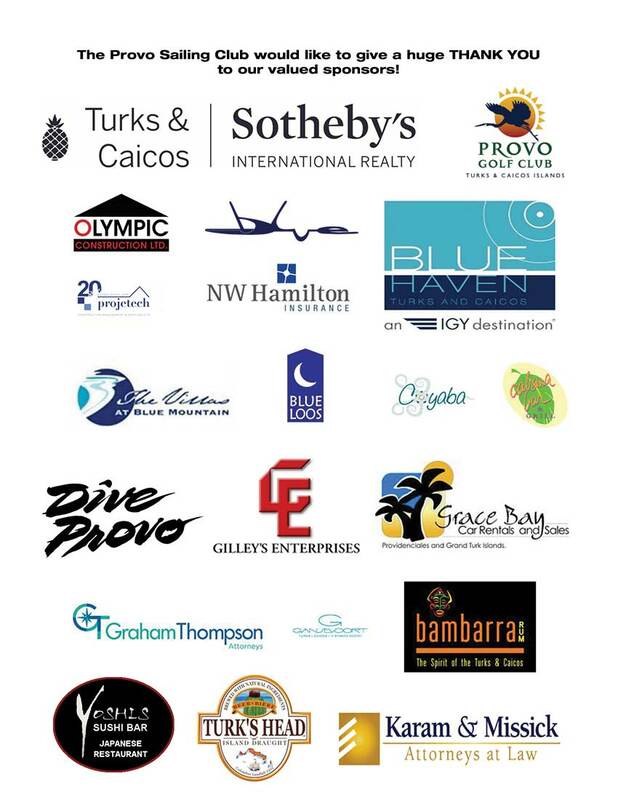 In 2010, Provo Sailing Club had to form the Turks & Caicos Islands Sailing Association (TCISA) to become a member of the International Sailing Federation. 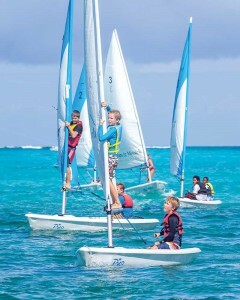 Children learn to sail on Provo Sailing Club’s Pico dinghies. The association gained energy and enthusiasm, and by 2011 was holding regular races for junior and senior sailors, offering training programs, and hosting “Sail Away” socials to raise operating funds. By 2012, they were able to purchase 12 Laser Picos for use by club members and in 2014, an 18 boat fleet of 40 sailors participated in the Queen’s Baton Relay, with local sailor Justin Parker bearing the baton. The club now operates from a group of weathered buildings at the Children’s Park in The Bight, where their fleet of sailboats is “parked” in the sand. I recently spoke to Keir Clarke, who was hired to take over management of the Provo Sailing Club in September 2015 by President David Douglas. Keir is a former European Laser Champion, who “retired” at the age of 22 from the stressful life of the sail racing circuit to make use of his talents in organization and teaching to continue the growth and development of the thriving club. Sailing has taken Keir all over the world, from Zanzibar to Vietnam, but on arrival in the Turks & Caicos, he fell in love with the country’s unique blend of “old and the new.” He is overjoyed by the fact that while he is working with modern, new, racing dinghies, he is essentially teaching an age-old traditional skill, which we can still catch a glimpse of in parts of the Islands. It’s still possible to see the hand-built native sloops that were once the lifeline of the TCI economy, especially in the Providenciales communities of Blue Hills and Five Cays, and on the islands of North, Middle and South Caicos. Made from the wood of local trees, these sturdy vessels expedited travel and trade between the Islands, and to the nearby Caribbean region. Their brave sailors regularly braved weather, tides, reefs, and equipment breakdowns. I think that’s why Keir is so enthusiastic about the sailing lessons TCISA offers for adults and children. He sees it as an opportunity to pass along the skills that were so important to the country’s founding fathers. He says, “It’s my favorite part of the job. We have a Kid’s Sailing Club every Sunday afternoon. I went to the schools to introduce the program and we now have 20 to 25 kids coming regularly to learn how to handle the boats and sail. We offer five week Level 1 and 2 certification courses on our Laser Pico and Hobie Wave sailboats. It’s a fun environment, but the kids do get serious training in all the aspects of seamanship. Sailing courses follow the syllabus of the Royal Yachting Association.” Keir is especially gratified by a group of boys from the rugged Dockyards area of Kewtown. He says they make a special effort to show up each Sunday and have progressed so far that they are now helping him give lessons to other children and keep the boats and clubhouse in order. In fact, the club strongly believes that sailing fosters youth leadership, sportsmanship, environmental stewardship, and so makes available sailing scholarships to local schoolchildren. Thanks to Provo Sailing Club’s sponsors, local youth train on six new Olympic Class Laser Radials. 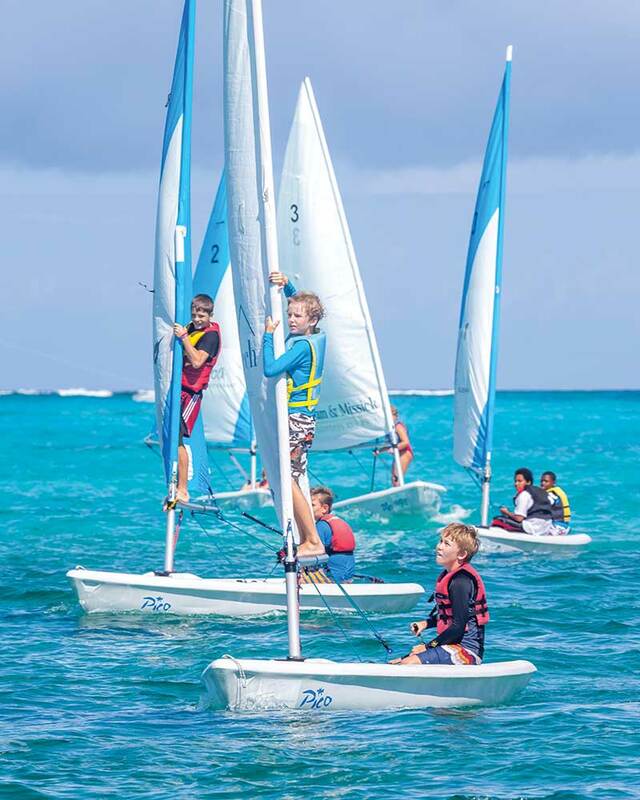 Keir’s goal, apart from introducing new people to the sport and gaining club memberships, is to build up the club’s Youth Squad, in under 12 and under 18 age categories, to compete in Inter-Caribbean regattas. Many of the young sailors learned from volunteer coaches in the club’s Junior Sailing Clinics started in 2010: Adam Twigg, Simon Wood, Robin Spruce, Dave Keil, Mardie Doverspike, Jeff Lee, Joe Lemoyne, Darryn Mcarthur, Tim Hanlon, Kristof Lingier, Pat Staples, and Commodore Mike Rosati. The Youth Squad currently trains on Tuesdays, Thursdays, and Saturdays, maneuvering the small boats in racing courses to hone their skills in tacking, gybing, and ultimately becoming experts in racing. In December 2015, top club sailor Daniella Douglas journeyed to Malaysia to participate in the World Youth Sailing Championships (WYSC). It was a great learning experience, as Daniella first participated in an International Sailing Federation Emerging Nations Sailing Clinic in Antigua in July, then trained on a borrowed Laser boat, receiving a WYSC scholarship to go to Malaysia. She finished 45th out of 54 (in the “emerging nations” division, she placed ninth out of fifteen sailors.) Keir’s expertise in coaching, equipment adjustments, and sailing in international events was key, and in December the PSC purchased six new Olympic Class Laser Radials. TCISA also hosts sailing lessons for adults (Wednesdays at 4:30), sailing camps on school holidays, Laser training on Saturdays, and Hobie races on Friday nights. Among other sailing events, they host the annual Heritage Regatta each October, in which local sloops and dinghies compete, and, of course, the Fool’s Regatta, now held in mid-June and bigger and better than ever. It includes races between schools, resorts, kids, parents, kayaks, and even rafts! Club funds are raised through membership dues, social events, and sponsors. Membership (offered weekly, monthly, or yearly) allows use of club boats and discounted fees for lessons and programs. Keir is keen to promote villa memberships and daily memberships for long and short-term visitors so they can enjoy sailing during their vacations. Social events are held throughout the year. The most recent Christmas Party raised nearly $13,000. This February, TCISA held one of several annual open houses at the beachfront headquarters to introduce to the community the joys of sailing. The events are lively, fun-filled, and a great get-together, with Turks Head Brewery consistently donating plenty of cold beverages to keep everyone well-lubricated. TCSA is proud of its many sponsors. 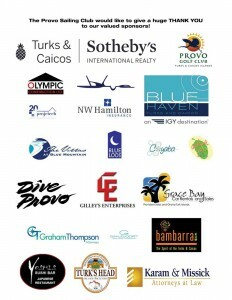 Besides local organizations donating services, materials, or prizes for races and events, the club’s major sponsors are recognized with their logo on the sail of a boat. What better way to “see and be seen” than to have your logo sailing up and down Grace Bay or circumnavigating the island? For more information, visit www.tcisailing.com or Facebook Group, Provo Sailing Club, or Facebook Page, Turks And Caicos Islands Sailing Association.